This morning on board the Asteria for our 10am whale watch, Hippocampus and Northstar were very active! They spent lots of time diving and were very likely subsurface feeding. Digital tags have shown that humpbacks pursue sand lance at depth by rubbing the sides of their bodies into the sandy sea floor of Stellwagen Bank forcing hundreds, even thousands of sand lance out of hiding and into the water column. These humpbacks are then able to capture mouthfuls of these tiny fish one after another. While we can only speculate as to what this duo was actually doing beneath the ocean’s surface, something was keeping them down and it was most likely their lunch! For those of you who are looking for an update on Northstar’s recent injury, here is a close up from today of the wound on the right side of his back which appears to be healing well. From the looks of it, the wound area is receding as healthy tissue grows forward. As long as we see Northstar regularly, we will continue to provide as much information as we can about the progress of this healing process! Today on the Aurora for the 12 pm whale watch, we travelled out to the northwest corner of Stellwagen Bank. The beautiful sunny weather, light wind, and calm seas gave us wonderful conditions for searching for whales. It always amazes me that we head out to these areas and are able to spot whales so easily. We quickly spotted two exhalations in the distance that turned out to be our dynamic duo, Hippocampus and Northstar! We haven’t seen much apparent feeding behavior from these two humpbacks over the past week but their erratic dive times and pattern of travel looked like they were searching for food. We did spot a bubble cloud which hopefully means that searching has been fruitful. Passengers really enjoyed seeing this unique feeding behavior! 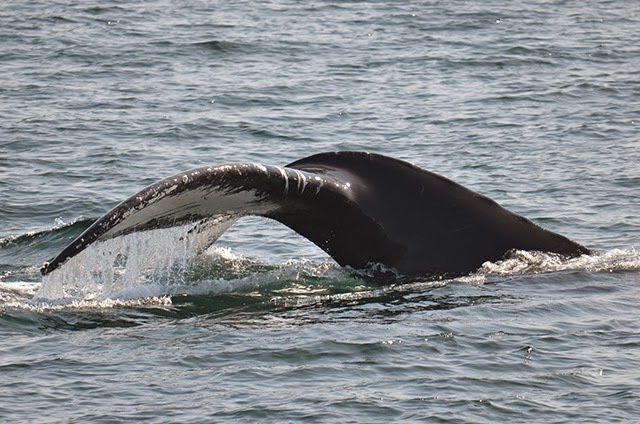 Throughout the whale watch, we passed an abundance of boat traffic, including a large LNG ship, a tuna boat, the Massachusetts Environmental Police, many recreational boats, and the Auk, Stellwagen Bank National Marine Sanctuary’s research vessel. As ever this made us mindful that Stellwagen Bank is a shared environment and it’s important to balance all of its diverse and important uses in management and sustainable future. This morning we headed out to the southwest corner of Stellwagen. We decided to travel south to switch things up and it sure paid off! Upon reaching the edge of the bank we found a fast moving finback whale who was taking nice short dives of 2-3 minutes. 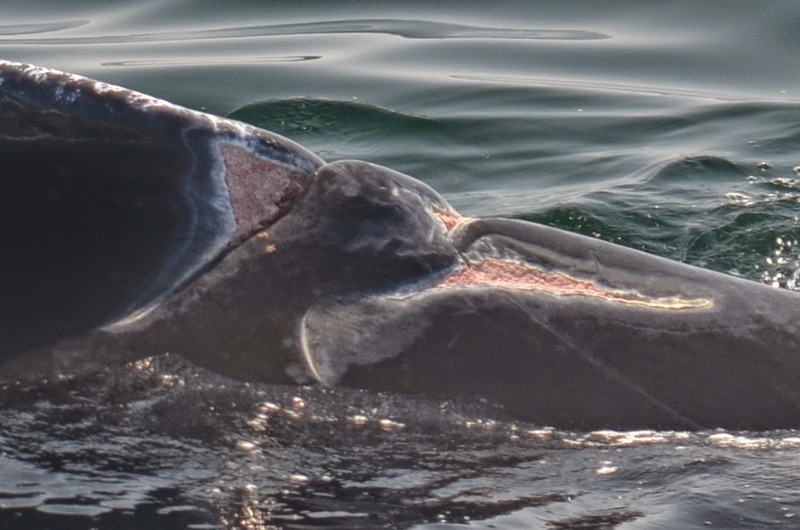 This individual was a particularly large finback. 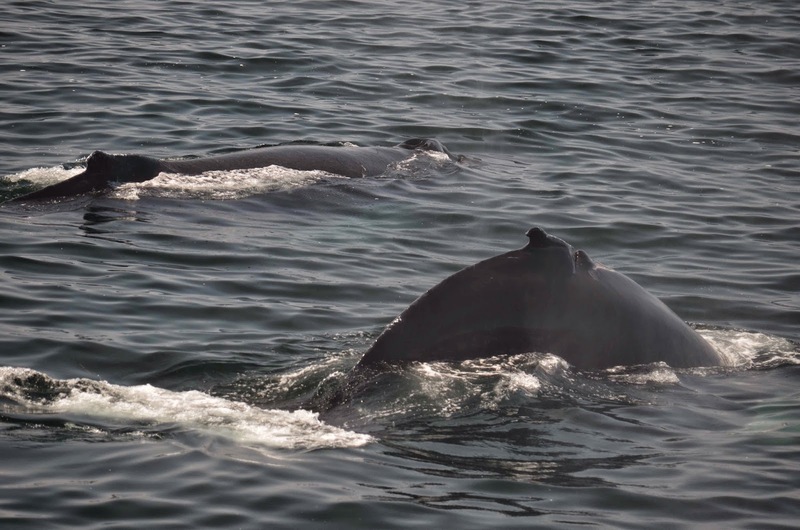 When the finwhale was down on a dive, we continued spotting and found 2 logging humpbacks in the distance. We travelled their way to investigate and we found Nile and her 2014 calf! Throughout the last 15 minutes of our trip, Nile and her calf stayed resting at the surface. Just as we were wrapping-up, the pair took a dive, exposing Nile’s beautiful type 4 fluke! 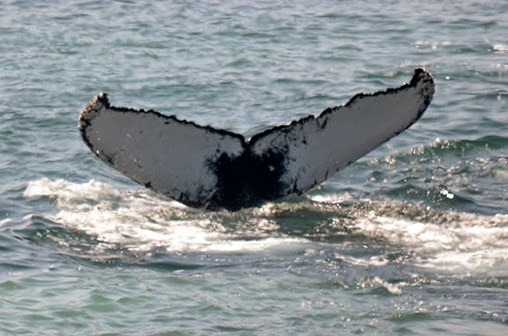 We thought our trip had ended, but on our way back to Boston, maybe 20 minutes off the bank, we saw 2 MORE humpbacks! Luckily we were at the right angle for a photo and were able ID them as Tongs and her 2014 calf. This afternoon, we headed out once again to the SW corner of Stellwagen Bank. We had nearly perfect whale sighting conditions with glassy, flat-calm seas with sunny warm temperatures. After a few minutes of searching on the bank, we easily spotted a whale in the distance. 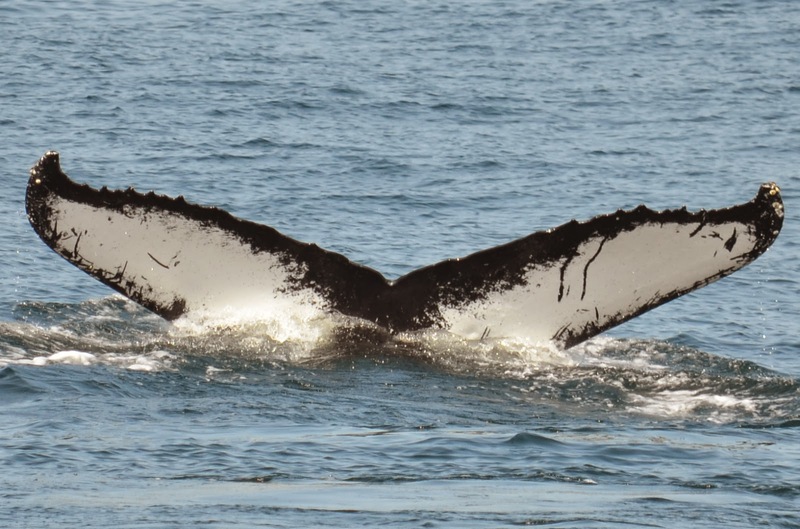 It turned out to be a female humpback whale named Dyad! She was taking 2-4 minute dives and consistently fluking. We even saw evidence of some bubble cloud feeding later in the trip. A few times, Dyad would fluke as though she was taking a deep dive, and then would pop up moments later at the surface. It was a beautiful day for a whale watch with a beautiful whale to boot. — Hannah & Annie G.